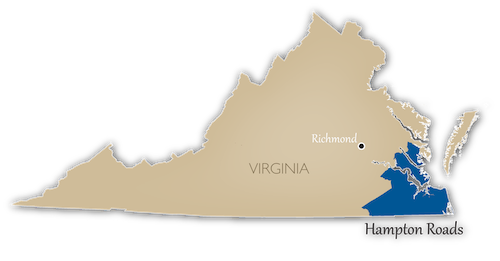 We are Virginia Beach's CUSTOMER SERVICE tree care business, serving all of the Hampton Roads area. We are a customer service business that provides great tree care. Our focus isn't just on tree care but also on our customers. We know you have choices when selecting a tree service company in Virginia Beach, so we differentiate ourselves in our customer service approach - treating each customer (and prospective customer) like we would want to be treated ourselves. Please call us for a free, onsite estimate. We can often be at your property the same day of your call. ​We started a tree service Virginia Beach residents could trust to provide both quality tree care services and great customer service because we knew people would respond. Having used tree care companies in Virginia Beach and the greater Hampton Roads area, we knew that a conflation of these two business objectives would position us not as a competitor in the market but an innovator. Consequently, we focus on customer services as much as we do tree care because we know people appreciate and value being treated well. In today's commodity consumer marketplace, where products and services are indistinguishable​, we knew having a service based tree care company was avant-garde. Here are the top 9 reasons you may want to consider calling us when you need professional and quality tree care. These reasons are what differentiates us in the market and, we believe, makes us innovators and not competitors. But don't take our word for it, please judge for yourself our rationale to consider the tree care Virginia Beach uses when customer service is important. ​A plethora of service businesses will offer 100% satisfaction, yet do they actually stand by their commitment? Virginia Beach Tree does! There is an old adage, "it is not what you say, it is what you do". We stand by our service guarantee by not just pledging it but by executing on it. Tree companies in Virginia Beach are a proverbial "dime a dozen" so how can one stand-out? By committing to EXCELLENCE and then exceeding on that promise. That is what we do at Virginia BeachTree with each and every customer interaction we have. Anyone can cut a tree, but to do so with quality, professionalism, and with the utmost focus on satisfying our customers takes a commitment to innovation in the tree industry. ​We offer the complete spectrum of tree care services any home or business owner could expect and want in a tree care business. Our service offerings cover the complete lifecycle of a tree, to include service rarely provided by other companies, such as fertilization, chipping, planting, and falling. 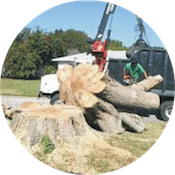 Our tree care specialists and arborists have decades of experience in providing all of the listed services below, across the entire Southeastern United States. As part of our customer service commitment, we are the one-stop provider for all tree care related services. The complete, 100%, satisfaction of our customers. ​Here is the challenge: the tree care business has some expensive overhead elements yet our customer demand affordable tree care prices. Tree businesses have a variety of fixed and variable costs: equipment, labor, and insurance. Equipment costs, for example, run approximately $17K for stump grinders and over $25K for dump and bucket trucks. Insurance, in the form of workers compensation, is an additional 20% of our labor costs. This means that for every $1K in labor cost, we have an additional $200 in insurance expense. Now every business has overhead expenses, and we are not complaining. It is just a business face that in order to operate we need to cover these expense and make a little profit. To do so, we offers fair, honest prices for all our services that are a win: win for both our customers and our business. We understand our customer want low prices, however, we also know that they want quality work. Therefore we believe that BEST VALUE pricing is the solution. In offer value pricing, we can provide professional, quality tree care services are prices that meet our customers' expectations. Now we may not be the lowest priced service company in Virginia Beach, but we will offer the best value pricing that combines quality with affordability. We believe this offers the best of both worlds to our clientele. ​See our tree service cost page for more details on pricing. Every tree business should be licensed and insured, but unfortunately, some are not. Especially those that, often times illegally, go door-to-door soliciting your business. Now, we don't begrudge any enterprising person for working hard, "knocking on doors", and generally getting out there in hustling - that is what makes this country great. However, in the tree industry, insurance (and licensing) is a critical component for your peace-of-mind as a tree care customer. Without it, you expose yourself to financial, and even possibly, legal risk. Without workers compensation and umbrella coverage, home and business owners who use un- or underinsured tree companies assume the liability should an accident happen on their property. We suspect you don't want to assume that risk, even if unknowingly. Therefore, it is paramount that you ONLY consider tree care companies in Virginia Beach VA that are property and fully insured and licensed. ​One of the best ways to choose a tree company, or any service provides, is the read the reviews of their performance from reliable internet sources. We encourage our customers to review our work, post their experience, and otherwise let the public know if we are what we say we are. Better yet, ask friends and family members if they have used us to get a firsthand, personal account of our quality service. Lastly, consider reliable internet sources for others' testimonials about our service work to evaluate us vs your other considerations. We trust you will come to the same conclusion so many of our other loyal customers have: we are the tree service Virginia Beach residents rely on for professional, quality, and affordable tree care. ​We know when you call for service, you want someone to come out to your home or business quickly to give you an assessment and price quote for the work. Further, we also know when you call, you don't want to leave a message: you want someone to pick-up the phone when you call to immediately begin to handle your request. We strive to meet both of these objectives in quick, responsive on-site estimate often the same day that your call. Therefore, we have built our business model to provide you with both of these courtesies whenever you call and request a price quote. Now we would be lying if we said we always meet these two objectives - sometimes business and circumstances conspire against us and the best we can do is call you back ASAP and then get out to your property quickly. However, we want you to know that it is our goal to meet both of these business responsiveness goals as much as humanly possible. Storms and ice can wreak havoc on your trees, causing crippling damage to them and your property. And living near the Atlantic Ocean, tropical storms and hurricanes are even worse. We consider ourselves a first responder in these dire situations where other law enforcement, power companies, and medical personnel are required in the aftermath of strong storms. Tree damage to your property, structures, and power infrastructure can certainly be crippling. It is for these reasons, we operate 24x7 during storm damage periods to quickly and efficiently clean-up the mess and enabling others to perform their restoration jobs. During these situations, we operate with extended crews that we source from nearby, but unaffected communities. This enables us to do more work in less time, aiding our customers faster than we normally operate. When you call, we will quickly dispatch a team lead to your property to assess the tree damage clean-up effort, provide you with a verbal quote that will be followed up quickly with a written estimate, and then rapidly direct a crew to your property to commence the restoration effort. This is one of the many reasons we are the tree service company Virginia Beach and the greater Hampton Roads area trusts and relies on for their tree care business. We manage and operate our business like any serious, professional service company would. We subscribe to all the advice and guidance of the Tree Care Industry Association (TCIA), which is a trade association of over 2,000 tree care organizations and affiliates whose mission is to promote and advance the tree care businesses. Additionally, we are proud members of the International Society of Arboriculture (ISA), which sponsors the professional practice of arboriculture throughout the world. Further, we have decades of hands-on arbor and business experience to draw upon in serving our customers and the greater community. Lastly, we have invested in our business, like any other serious, professional organization would, in equipment, personnel, marketing, sales, delivery, and management. We are locally owned and operated company here in Virginia Beach, VA. We aren't a franchise model like the big national brands, such as Monster, Davey and Asplundh. Instead we operate independent of a franchise corporate partner, and as a result, can offer reasonable pricing along with differentiated services. Further, we are committed to the communities we serve by investing back into them with charitable donations of money and our time. We sponsor a number of different charity events throughout the year and provide mentorship programs for youths interested in tree service as a career. If you don't call us for your next tree car need, please consider buying locally nonetheless. For more information about tree care and general services, visit our blog. We discuss various tree care topics that will enable you to make better information decisions both about your trees' health but also in how to choose a quality tree contractor in Virginia Beach, VA.